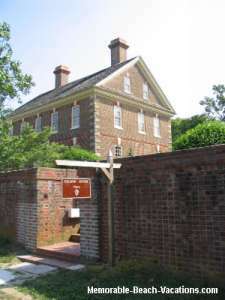 - Free Time Share Vacations - Getaways with a Tour "price"
+ Historic College of William and Mary. Virginia Beach is in the Guinness Book of Records as "The World's Longest Pleasure Beach." Virginia Beach and the surrounding vacation beaches area offers the unique combination of an expansive sand beach, an over three mile long "Boardwalk,"
-- and a bicycle path - something for everyone. A great reasonably priced family vacation beach destination. No, I don't work for the Virginia Beach Chamber of Commerce, but my Wife and I have really been impressed with the places of interest in Virginia -- and the Virginia Beach area and nearby vacation beaches attractions in particular! The surrounding area has many outstanding places of historical and scenic interest and great attractions within 45 - 90 minutes driving time for enjoyable Day Trips out from Virginia Beach vacation beaches. 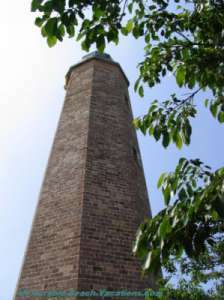 Cape Henry Lighthouse - Built 1791 At North end of Virginia Beach on Fort Story Military Reservation - Entrance at approx. 83rd & Atlantic Ave where Hwy 60 curves to west. Old 1791 and "new" 1881 replacement lighthouses are within a few blocks of each other. President George Washington approved original construction. Climb approximately 170 steps from behind the LIghthouse gift shop up to base of Lighthouse with great views of the Chesapeak Bay and nearby shipyards, and another 189 steps up the spiral metal staircase to the top. <<-- Enrich your Digital Life with the Many Features of Media Suite 10 Ultra! Good exercise and a reward of a great view at the top! Light is removed so there is area to walk around and enjoy the 360 view which includes the "New" 1881 lighthouse next door, the old lightkeeper house, a modern electronic ship "control tower" and the ocean. Tip: Drive down to the beach nearby and look at the 1607 Captain Newport memorial. Also access to a interesting area of beach used for Military "landing" training with a great view looking back at both the old and new Lighthouses a few blocks away. Take a free guided museum tour if you can be there at 11 or 1:30 - makes it much more interesting and guides tell you much more than is on display signs. Interesting ship models & figureheads + much more. This is really a great museum! Tip: If you can't get the tour above --don't miss the miniture carved ship exhibit and the turret of the ironclad "Monitor" gunship they have raised and are restoring outside in the big tanks. 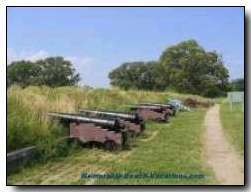 Allow 2-3 hours for this interesting Virginia vacation beaches Attraction. Start off with Visitor Center Movie and don't miss the self-guided BattlefielD driving/walking tour. Rent or buy the tape/CD guide narriation at the Vistors Center - makes it more interesting and fun. Allow minimum of 1/2 day. Drive the Colonial National Historical Parkway Scenic Road between Yorktown, Williamsburg, and Jamestown. Allow 2 hours if you go full length and allow time to stop at the many Scenic pulloffs and check out the great views. -- Not really a Day Trip, since is right at north end of Virginia Beach - but a definate "Must See!" First Landing State Park - Most popular State Park in Virginia. Can drive right by First Landings and not realize how big it is since it is hidden from the road! 2,770 acre mostly natural area sanctuary. The mile+ long north edge beach area runs adacent to Shore Drive and fronts onto Chesapeake Bay. Plus on the south side, Semitropical forests with large cypress trees, lagoons, and 19 miles of hiking and nature trails. Many camp sites + some cabins. 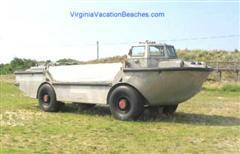 See First Landing Info and pictures on our "Other" Virginia Vacation Beaches page. Read Candid User Reviews and get 90+ Virginia Beach Resorts ranked by popularity with comparison pricing at this link: Find the best deal, compare prices and read what other travelers have to say at TripAdvisor for Virginia Beach Hotels & Vacation Condo Rentals. There are Pictures for some Resorts. 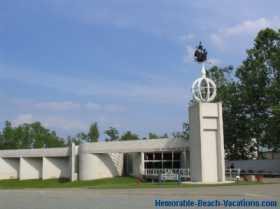 - You may even find a "cheap" Virginia Beach Hotel Rental. Oceanfront and non oceanfront listings are shown. - Click on the Green "B & B/Inns" link on above page for User Ratings and comparison prices of 3 Virginia beach area Bed and Breakfast's & Inns. LINKS - To Attraction List Web site Info, LINKS comments, and Web Site use Tips - includes all "Must See" web sites listed above + Virginia vacation beaches and general Virginia vacations Info Web sites. Virginia Beach Rentals - Top Picks - Ocean front Resort Condo Reviews + Vacation Vacation Condo Rental & Vacation Timeshare Exchange Tips - With Info Links. Fall Blue Ridge Parkway Vacation - Colorful Fall Photos and Tips - another "Must See" driving tour on the very colorful Fall Blue Ridge Parkway in Virginia - an affordable Fall Getaway Vacation or some fun "Add on Days" to a Fall Virginia Beach Vacation. Top Pick Virginia Vacation Guides: Southeast Virginia vacation beaches & Attractions Books & Guides. Favorite beaches, area attractions and places of interest you found interesting or memorable. Comments on great Virginia Beach area beach front Timeshare Resort weeks you may own, have exchanged to, or rented. Local Points of interest, Attractions, and beach front dining (Gene's big place of interest!) you have particularly enjoyed on your Virginia Vaction would also be of interest to all our "viewers." Attached photos to go with the comments are always appreciated!!!!! Send us Your Top Picks and Comments on our Gene Seecann Sites Comments Page. Thanks! Thanks for checking us out -- Bookmark us or subscribe to our RSS Feed and come back soon and see what's new! Plus "Like" us at Affordable Beach Vacations on Facebook and post on our "Wall" to keep in touch. -- scroll down on the page for some beach vacation photos. Get our US Beach Vacations mini-Blog - RSS Feed - To US Vacation Beaches Blog Info Page + RSS mini-Blog with easy subscribe links - no e-mails! Your Comments & Suggestions - We appreciate hearing from You! Looking for Something Specific? Search 3 of our US Vacation Guide Sites.